4 Bedroom Semi Detached House For Sale in Preston for Asking Price £290,000. This substantial semi detached four bedroom home has been mindfully designed to provide an exceptional family home of quality and provides charming original features flowing effortlessly from one room to the next. The high ceilings, skirting boards, stained glass and open fires create a real heritage feel as soon as you step through the door. 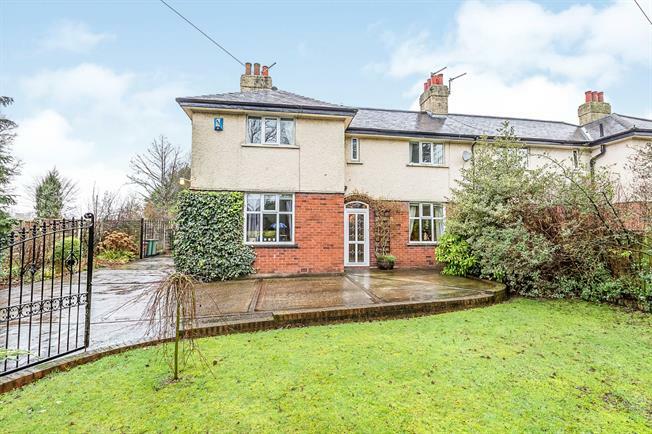 This attractive property boasts a wealth of potential but offers excellent family accommodation set on a much larger than average plot amongst beautiful private and mature gardens. The accommodation briefly comprises of a welcoming entrance vestibule continuing through a stained glass internal door into an imposing reception hallway. The living room provides a dual aspect, a lovely light and airy spacious atmosphere with an open fire. Mirroring this, is an additional family room with open fire, perfect for day to day living or relaxing. The dining room adjoins onto the farmhouse style kitchen, a wonderful space for entertaining the family, the facility of a large range master oven and ample workspace. There is also the facility of a ground floor shower room. Upstairs, you will find four generously proportioned double bedrooms, a separate WC and a family bathroom. Externally, the property is set back from the road and is approached via large wrought iron gate into a spacious driveway suitable for approximately 8 cars. This leads you to a double garage/workshop with power sockets and lighting, ideal for if you have a hobby. Beyond this point, is a beautiful private garden surrounded by many mature trees, a patio area with shelter and a large vegetable plot. Viewing is to be strictly considered and highly recommended. UPVC double glazed entrance door. Tiled flooring. Internal stained glass entrance door leading into the hallway. Stained glass internal door. Radiator, carpeted flooring, picture rail. A beautiful spindle staircase leading to the first floor. UPVC double glazed door, opening onto the garden. Double glazed uPVC window facing the front. Radiator and wood burning stove, original floorboards, dado rail and picture rail, original coving. Double glazed uPVC window facing the front. Radiator and open fire, carpeted flooring, picture rail. Double glazed uPVC window facing the side. Radiator, solid oak flooring, built-in shelving and storage cupboard. Double glazed uPVC window facing the rear. Tiled flooring. Wood work surface, a range of fitted wall and base units, Belfast style sink, range master oven, stainless steel extractor, space for dishwasher, space for fridge/freezer. Double glazed uPVC window facing the rear. Radiator, tiled flooring, part tiled walls. Low level WC, single enclosure shower, vanity unit. Loft access with pull down loft ladder and boarded. Double glazed uPVC window facing the rear. Radiator, carpeted flooring, dado rail. Double glazed uPVC window facing the side. Radiator, carpeted flooring, built-in storage cupboard, dado rail and picture rail, original coving. Double glazed uPVC window facing the front. Radiator, original floorboards. Double glazed uPVC window facing the front. Radiator, carpeted flooring, built-in storage cupboard, picture rail. Double glazed uPVC window facing the front. Laminate flooring, dado rail. Low level WC. Double glazed uPVC window facing the side. Heated towel rail, laminate flooring, dado rail and part tiled walls. Freestanding bath, pedestal sink.